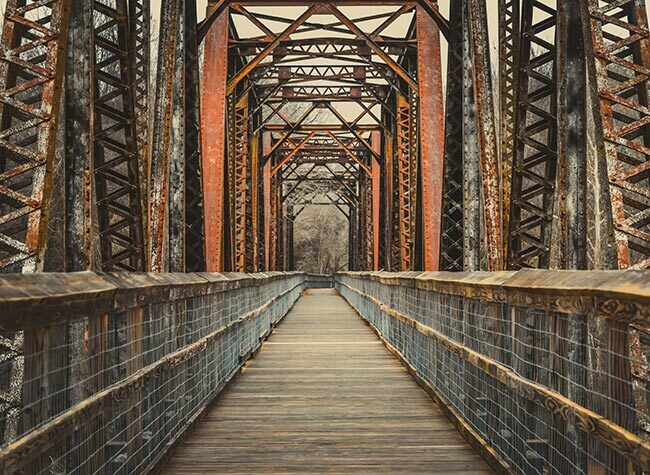 The Palmetto Trail runs through many South Carolina counties, and the pictures below were taken in the small town of Peak in Newberry County. When it is completed, the trail will stretch 425 miles across the state – from the mountains to the sea. 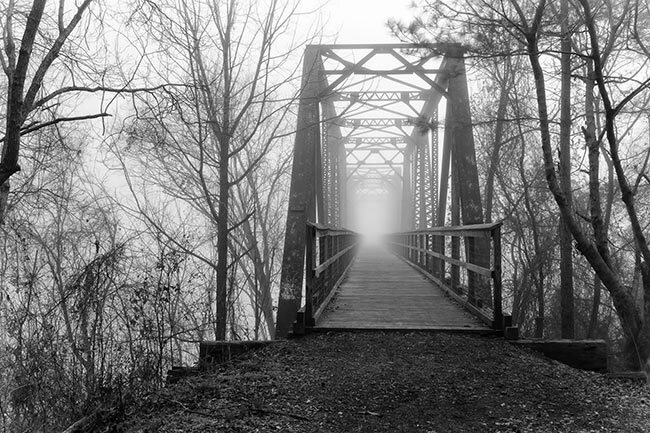 Photographer Ralph Mayer tells us that this railroad bridge was built in 1890 and crosses the Broad River. 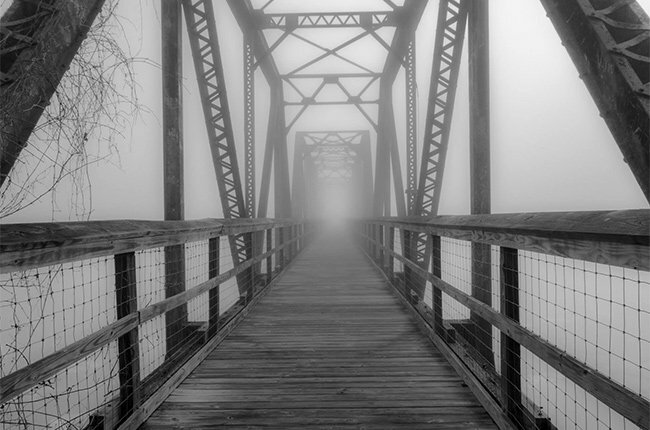 The original bridge was intentionally burned by the Confederate troops during the Civil War to slow the advance of General Sherman’s troops. Ralph adds that it is a wonderful part of the Palmetto Trail to enjoy hiking and biking! 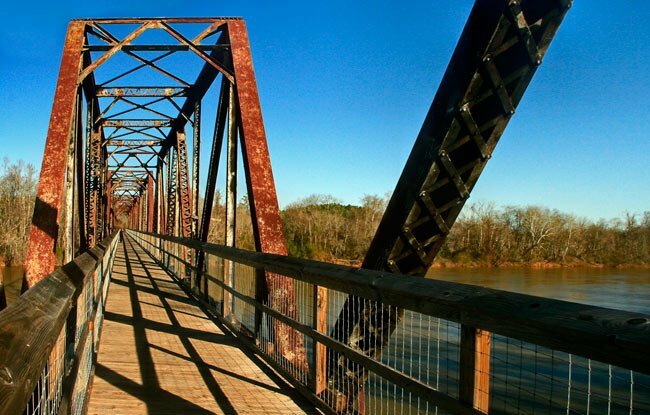 This statewide trail system was first conceived in 1994 by the Palmetto Conservation Foundation, and is a federally-designated Millennium Legacy Trail. 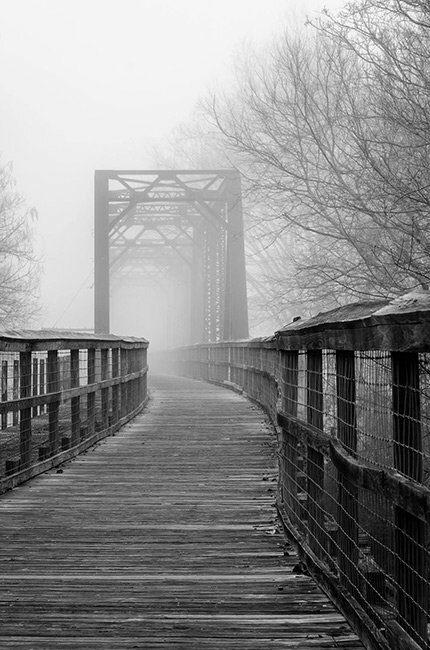 The Palmetto Trail connects many existing trails and paths which showcase our state’s history, culture, and unique geography. It is broken down into passages that can be enjoyed in just a day, or over a couple of days, so don’t feel overwhelmed by the thought of hiking across the state all at once! The second raised structure on the Peak to Pomaria section of the trail is a wooden trestle. 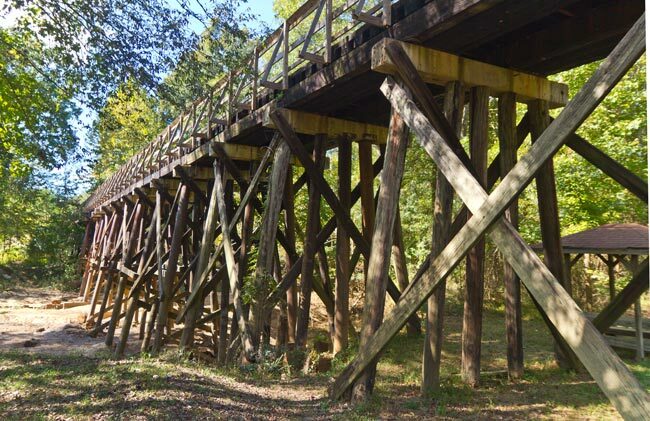 About a half-mile from the former train trestle that crosses the Broad River, it allows hikers and cyclists to continues on the trail without having to detour on the roads. 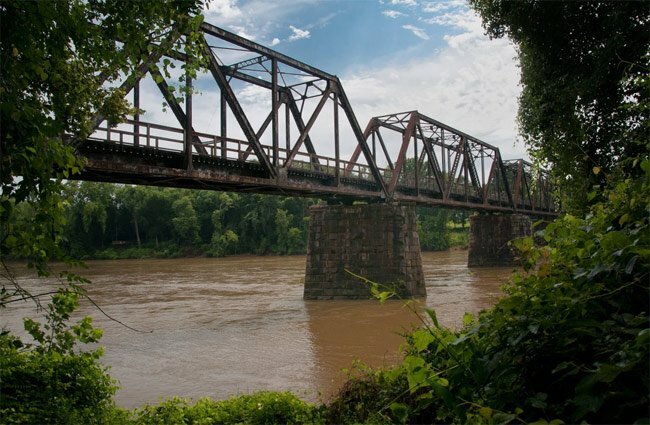 The Palmetto Trail is made up of a wide variety of trails – from urban bike trails and greenways to Revolutionary War battlefields and hiking trails. Once completed, this will be one of only sixteen cross-state trails in the country. We love this trai and have seen a lot of wildlife on it. Anytime of year it is beautiful. Wear sturdy trekkers or hiking boots…the granite gravel is a challenge for your feet. Hopeing for a dayhike on Christmas Eve 2012. Great place for lunch in Prosperity at the Frawg Café (lunch till 2 & breakfast 6-10.) We have hiked on the Peak-Prosperity Passage at least eight times or more. Enjoy!! This was a nice trail, but it sure felt a long longer than 6.4 miles and the gravel on the trail made it that much harder. If you are not in good shape, don’t walk this trail. I still feel it in my feet and legs . We walked from the Alston trailhead to pomaria and back, the railroad trellis were the easiest to walk and you definitely need hiking boots for the gravel and the fact that you can break your ankle or leg very easily in tennis shoes. Visited this trail last weekend it was GREAT, I really enjoyed it … they have done a WONDERFUL job!